A Storytelling Initiative in collaboration between Morrell Park Elementary/Middle School and the Jewish Museum of Maryland, featuring the work of Morrell Park Elementary Middle School students. Presented by the 8th grade students of Morrell Park Elementary Middle School, with the guidance of author Jonathan Scott Fuqua and Johns Hopkins film students Amelia Voos and Marta Rybczynski. Light refreshments to follow the screening (dietary laws observed). FREE – Reserve Your Seats! Please join us as we welcome to the JMM Michael Dobbs, author of The Unwanted: America, Auschwitz, and a Village Caught in Between. He will speak on his powerful book which tells the story of a group of German Jews desperately seeking American visas to escape Nazi Germany, and is an illuminating account of America’s response to the refugee crisis of the 1930’s and 40’s. Drawing on previously unpublished letters, diaries, and visa records, Michael Dobbs provides a vivid picture of what it was like to live among increasingly hostile neighbors, waiting for “the piece of paper with a stamp” that meant the difference between life and death. Here is the riveting narrative of a small community struggling to survive amid tumultuous events and reach a safe haven despite the odds stacked against them. Michael Dobbs was born and educated in Britain, but is now a U.S. citizen. He was a long-time reporter for The Washington Post, covering the collapse of communism as a foreign correspondent. He is currently on the staff of the United States Holocaust Memorial Museum. His previous books include the bestselling One Minute to Midnight on the Cuban missile crisis, which was part of an acclaimed Cold War trilogy. He lives outside Washington, D.C. Presented in partnership with the United States Holocaust Memorial Museum and the Enoch Pratt Free Library. The Shapiro Lecture Series is supported by a bequest from Mrs. Gloria L. Shapiro. 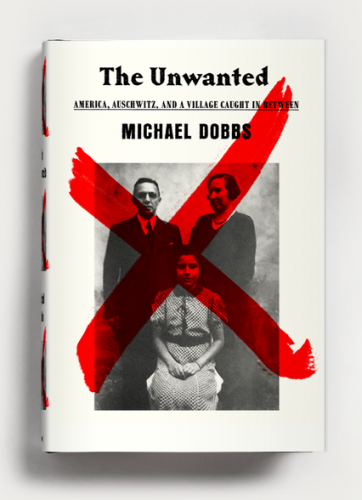 Published by Knopf in association with the United States Holocaust Museum, The Unwanted is part of a groundbreaking educational initiative that includes the new Americans and the Holocaust exhibition in Washington, DC. A Storytelling Initiative in collaboration between Graceland Park Elementary/Middle School and the Jewish Museum of Maryland, featuring the work of Graceland Park Elementary Middle School students. Presented by the 7th grade students of Graceland Park Elementary Middle School, with the guidance of author Jonathan Scott Fuqua and Johns Hopkins film students Amelia Voos and Marta Rybczynski.